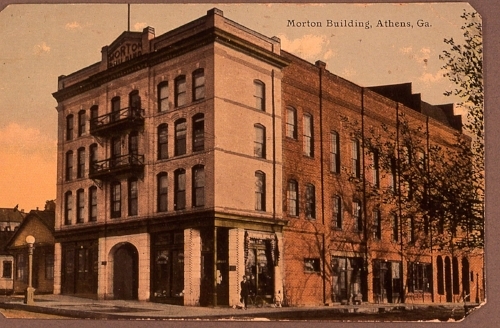 The Morton Building was built in 1909-1910 by Monroe Bowers "Pink Morton. It was described in 1914 by the Athens Daily Herald as the "largest building of its kind to be owned exclusively by a colored man in the world." The Morton Building is now listed on the National Register of Historic Places. The Morton Building occupies an important place in the history of Athens' black community. At one time the Morton Building, along with the now-destroyed Union Hall and Samaritan Building, formed the core of the downtown black business district. Over the years the building has housed the offices of many prominent black professionals, a number of black-owned businesses, and the Morton Theatre: the major entertainment facility for the black community of Athens for many years. Many of Athens' black doctors, dentists, and pharmacists practiced within the Morton Building. Among these were Dr. Ida Mae Johnson Hiram, the first black woman to be licensed to practice in the state of Georgia, and Dr. William H. Harris, one of the founders of the Georgia State Medical Association of Colored Physicians, Dentists, and Druggists, who was also perhaps the most prominent of Athens' early black physicians. A great many other black businesses have been located in the Morton Building throughout the years, including the first black-owned drugstore in the city owned by Dr. E.D. Harris, for whom the pharmacy area of the Building, now used mostly for receptions, is named. Other businesses included various insurance companies, pool halls, restaurants, barber and beauty shops, a bakery, and even a few mortuaries. Although the Morton Theatre is an architecturally significant place, the architect remains unknown. When the building was acquired by the present owner, a set of plans for a theatre prepared by architect Frank Cox of Chicago was found in the building. It was believed that these were the original plans for the Morton Building and Theatre, which would have been simplified in actual construction. Research has proven these plans were meant to be used during the renovation of the nearby New Opera House. Renovations were made to the Morton Building in 1906, and it is possible that Pink Morton, a contractor, modified Cox's original plans for the construction of his own building. Two known renovations of the Morton Theatre occurred in 1918 and during the 1930s. The 1918 renovation consisted of the addition of the pressed metal ceiling and the change of the interior wall color from a lively light blue to a more neutral and subdued beige. The 1930s renovation included the addition of a projection booth which replaced the original upper-level gallery area. The Morton Theatre continued to be the center for entertainment and important gatherings for the black community until the theatre was closed down by the Fire Marshall after a small fire in the projection booth. This close down only affected the Morton Theatre, not the Morton Building as a whole. After the fire, the building remained in the Morton family until 1973, when it was sold to John T. Bond of Bond Properties, Inc. Although the theatre and most of the upper level offices were neglected, the Morton Building continued to house a beauty salon, a bookstore, a restaurant, and a photo lab. The Morton Theatre had been opened to the public on several occasions over the years to attempt to stimulate interest in the restoration and reuse of the wonderful performance space, which has been inextricably bound to the cultural and social history of Athens' black community. Using a combination of state and federal funds the building was purchased by the nonprofit Morton Theatre Corporation in 1980. Local bands such as Dreams So Real, The B-52's, and R.E.M. occasionally used the building as rehearsal space. R.E.M. even filmed part of the music video for "The One I Love" within the theatre. In 1987 the citizens of Athens-Clarke County came to the rescue of the Morton Theatre through the passing of the Special Purpose Local Options Sales Tax (S.P.L.O.S.T.). The SPLOST included granting $1.8 million for the restoration of the theatre, whose roof had since caved in. Ownership of the building was handed over from the Morton Theatre Corporation to the Athens-Clarke County Unified Government in 1991. Followed by the signing of a management agreement between the A-CC Unified Government and Morton Theatre Corporation, the Morton Theatre was reopened in the fall of 1993. The government provides staff to operate the Morton Theatre's function as a community performing arts center, while the non-profit Morton Theatre Corporation, run by a Board of Directors, develops programming and maintains operating policies.